Learn about the CarePlus Complete total benefits package. Finding a dental plan for your group that fulfills all their wants and needs can be time-consuming. But what if you could find a group dental plan that offers comprehensive dental coverage paired with full administrative support? And what if you could simplify things even more by requesting a plan design that pairs dental and vision with additional hearing offerings? 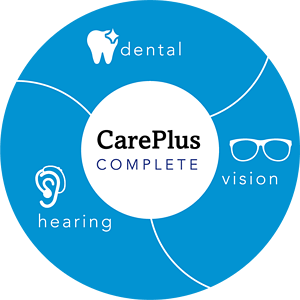 We now offer “CarePlus Complete”—your one-stop shop for locating a dental and vision offering paired with extra hearing benefits too! Read on to learn more about CarePlus Complete. Through our relationships with Superior Vision and hi HealthInnovations, CarePlus Dental Plans can help your clients maintain even better overall health. We offer multiple comprehensive and cost-effective vision plans and a discounted hearing aid program alongside our completely customizable group dental insurance options. Cost savings for both employers and employees with enhanced benefits. Customized dental benefit plans that fit your specific needs and budget. No deductibles or waiting periods on any services. Our network offers integrated care eliminating the need for out-of-network referrals. Care provided by Dental Associates, a family-owned Wisconsin-based company with 14 convenient dental centers. One of the largest provider networks in Wisconsin. Multiple comprehensive and cost-effective solutions. Greater convenience – members can receive an eye exam from one provider and choose to purchase materials from a different provider if they wish. Initial plan rates are guaranteed for 4 years from the issue date. Access to an exclusive discount on hearing aids from hi HealthInnovations. Support from a Nationwide network offering hearing tests and affordable, custom-programmed hearing aids. There is absolutely no cost to you as a CarePlus member after electing this benefit which is included in your CarePlus membership. *Access to the hearing aid discount plan is a voluntary benefit that must be selected by the employer. Members with UnitedHealthcare insurance have even greater savings.